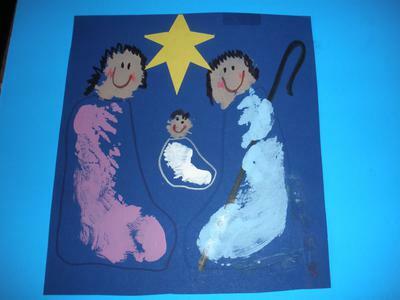 Here's an easy craft, a footprint and handprint Nativity scene. This is a great Sunday school craft for kids! Choose a Mary color for one foot and a Joseph color for the other foot (for clothes. Do only one foot at a time. Using a foam paint brush, paint the child's heel the flesh color for the face. Paint the rest of the foot (not the toes) with the clothing color. Wash & dry foot. Repeat for the other color clothing. Let dry. In the meantime cut out the yellow star. Then make a fist and paint a flesh face for Baby Jesus on the side of the hand just above the wrist line and finish out the fist and curled little finger with white paint. Press between Mary and Joseph. Let dry. Glue on the star. Use markers to draw faces and hair and outline the clothing shapes. Our Preschool uses these for Christmas gifts for their parents. This is such a nice idea, I just love it! Such a nice gift too. Thank you for sharing!